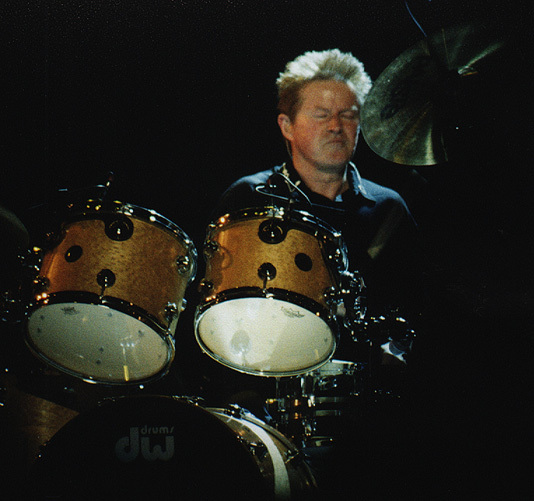 Stand out quote from interview with Don Henley "I think I'm going to enjoy this tour more...It's always good to get out of a windowless studio for a break. And the tour seemed like the logical thing.We will not, however, be performing new songs on this tour, because they'd be bootlegged and available online in no time." Let me start by saying I am embarrassed to be from Utah!! I am so glad I drove to Reno and enjoyed a full show filled with energy from the crowd. I could not believe how quiet and passive the crowd was here in Salt Lake City. To those fans who were on their feet and cheering loudly throughout the entire show, right on! Let’s start from the beginning. “Seven Bridges Road” failed to get people on their feet. I think there were seven of us standing and yelling – the seven of us that were holding beers. They only played half the song – just like in Denver. Everybody just sat there and applauded politely. I was appalled. It was even worse that everybody behind me (Row 12 – Floor) was sitting for the following three or four songs and I had to sit there too, out of respect for them so they could see the show. Many seats in front of us were empty until 8:30 – 8:45 – a good half hour into the show. 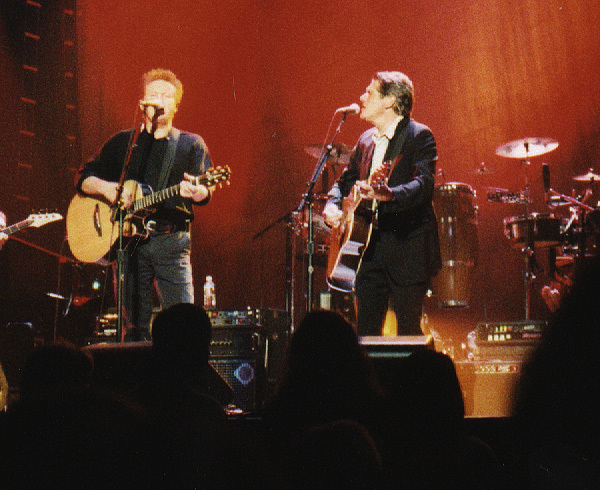 The Eagles didn’t realize that the majority of the people here are chronically late – to everything. The first quarter of the show had everyone in the Delta Center sitting, including the very front row. The acoustics were not that great from where I was standing. The Delta Center is notorious for bad acoustics and when I heard the Eagles were playing at this venue, I knew that the sound wouldn’t be up to par. That is one of many reasons Jill and I quickly agreed to drive to Reno. I have avoided many concerts at the Delta Center for years. There were some bad echoes of Glenn Frey in the beginning sets that bounced right back at him and it was hard at times to sing along. “Wasted Time” and “Pretty Maids” got people on their feet – finally, but Joe’s guitar wasn’t working and he was blatantly pre-occupied between verses with the technician trying to fix the problem. “Peaceful Easy Feeling” put everybody back on their butts. “Best of my Love” and the “All She wants to do is Dance” encore were completely cut out of the show. The crowd finally began to get loud in the last few numbers of the first half. The second half started great with good crowd response but as soon as Al Garth on the saxophone began to play “You Belong to the City” the crowd sat down in a complete silence. And to make that situation worse, a bad buzzing feedback was heard in the intro for about 3 seconds that made all on stage look at each other with a “what in the hell was that” look. Later, when Glenn introduced the band – we weren’t sure if Stuert got boo’ed or not because Jill and I were over compensating our cheering in an effort to overshadow those who might be booing. 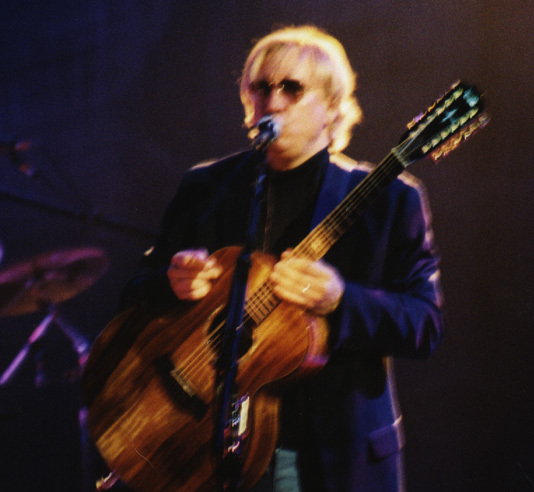 We are thinking that the chain of events lead to a lack of interest from Joe Walsh. I can’t say he stole the show like it has been said to this point on the tour. In fact – no one stole the show as an individual in my opinion. He pulled a few of his fun faces and some lyrical improv but it seemed like he did it because he was expected to. The energy that he has had previously was missing. The band itself was nothing short of fantastic as usual and we did enjoy the show. We got more smiles from Don Henley than I remember in previous shows, which I think is ironic. 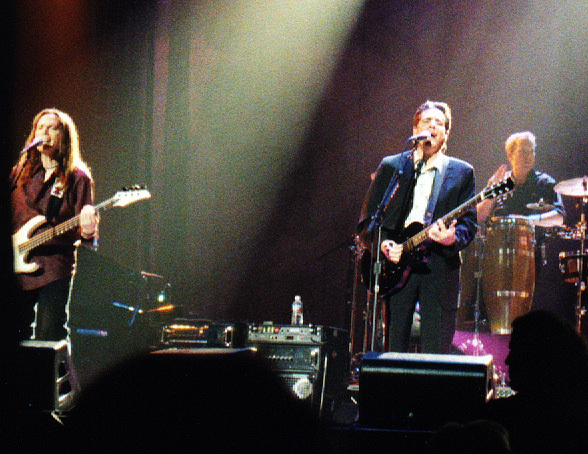 Glenn Frey and Timothy B. Schmit were there usual selves. I enjoy watching Timothy B. Schmit and how he makes eye contact with people in the crowd. The boys in the backup band did great. The good stuff was pretty much a carbon copy of other good shows. The show ended at 11:00, which is earlier than other shows due to the cut songs. As you read this, please realize that I am more critical at this point than usual because I have seen multiple shows now, including Denver’s Invesco Field show last August. The locals around here that I talked to seemed to have enjoyed the show and I have heard nothing but warm responses other than the many complaints that they didn’t do “Best of My Love”. I hope that the crowd is better to them in the upcoming shows. They deserve it. If they decide not to come back to Utah, I wouldn’t blame them at all. Was fortunate enough to be in the 1st row at the Delta Center in Salt Lake City. 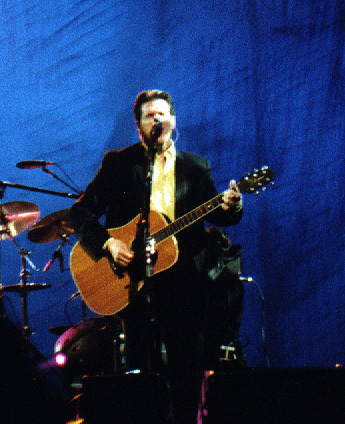 From the first line from Seven Bridges Road to the last line of Desperado, the Eagles proved that they have traversed time without a problem. From the second song, The Long Run, they had the people of Utah on their feet, dancing and singing 30 of their hits. They were backed by a stellar 6 piece horn section, a organist, and a drummer who shared duties and dual played with Don Henley. Also they have a new lead guitar player...sorry forgot his name, but he more than holds his own. The vocals were typical Eagles and the harmonies were as they were back in the 70,s. 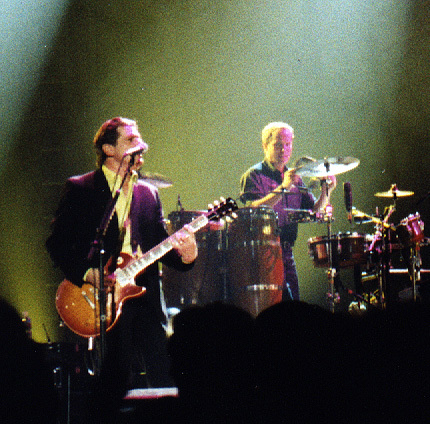 Glenn Frey, Don Henley, and Joe Walsh each did a few of their songs that they recorded on solo adventures. Boys of Summer, Already Gone and In the city were the stronger songs of the 1st half of the show. After a 25 minute intermission, Joe Walsh became the crowd favorite and rocked the house with Lifes Been Good ,Walk Away, Funk#49 and had Utah dancing in the aisles with Rocky Mountain Way. The second half featured Lyin Eyes, Sunset Grill, and a killer rendition of Dirty Laundry. The latter part of the show were the standard hits...Life in the Fast Lane, Hotel California, Take It Easy and sadly ended with Desperado...the 3rd encore. Prior to moving to Utah I lived in San Francisco and have seen just about everyone there is to see, but this concert will stick out as one of the best ever. It was very professional...and it was a trip to see kids in their late teens and early 20,s not just singing the songs, but knowing all the words....a whole new generation of Eagle fans. If they are headed your way folks...buy a ticket and go and enjoy a 1 of a kind band...The Eagles. First of all, let me say that I loved the concert and I am truly bummed out that there aren’t any dates closer to Wyoming so we could hit a second show. I wanted to start out with that statement so you will know that I am NOT giving the concert a bad review--I’m just trying to point out a few things. 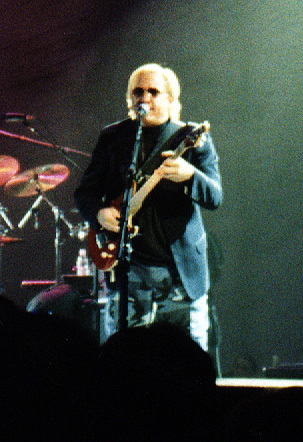 Two songs were cut from the opening night set. We missed out on “Best of My Love” and “All She Wants To Do is Dance”--which leads me to my first observation. As these are both songs with Don Henley on lead vocals, I was under the impression that maybe he wasn’t feeling well. He stayed behind the drums more than I had seen him do in Denver last year or in Las Vegas in 1999. Both he and Glenn Frey seemed to be having trouble hitting some of the higher notes. Interestingly, my brother was disappointed in this show versus the one last year at Invesco--where the sound was atrocious in the upper decks and the sound techs tried to change this by turning up the sound. When we started discussing it, he was disappointed because he wanted to see more of the Don Henley show and less of the Joe Walsh show. Thus, we all agreed that Don seemed to want to be out of the spotlight more on this show than the last one we saw. While Don Felder was still missed for his awesome guitar playing by my husband and myself, we did think that Steuart Smith did a better job this year than he did last year. I’m not trying to knock him or his talent at all. But last year he didn’t hit the notes in quite the right ways to make the guitar sing. He did come closer this year but he still isn’t Don Felder. But I guess we will just have to “Get Over It”! Maybe if he continues with the Eagles, he will continue to improve and become more a part of the band (which I think he has also seemed to do more this year than last.). From where we were sitting (to the side where Timothy B. Schmit calls home), it did seem that Joe made the show the most entertaining. Not that the others were falling down on the job. It just seemed like Joe was more into it and had the most energy, bouncing around the stage. But I have to say, I am pretty darn impressed that these guys are going out and doing about 4 shows a week at their age. After attending one concert, I was so wiped out that I needed a day to recuperate! So I am very impressed with their abilities to keep touring at this point in the game! 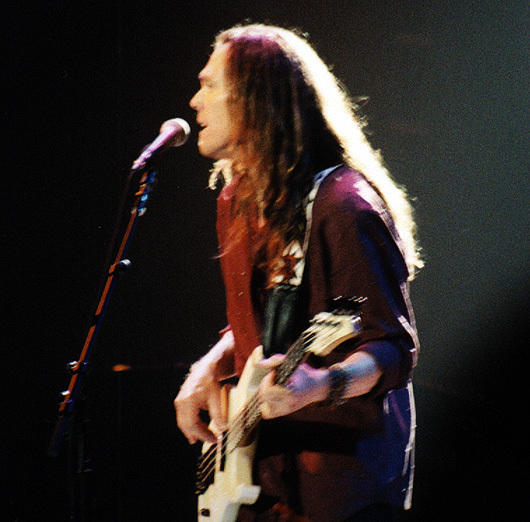 Timothy B. did an excellent job and I feel like his voice was the most true of the four band members. Age doesn’t seem to be affecting his voice at all. I’m hoping that a few more songs feature him on lead vocals on the new album. We did notice a few problems with the sound system. Joe was having problems with his amp. One time, during a guitar solo, we couldn’t even hear his guitar at all. We also missed out on the opening lyrics to one of Don Henley’s lead vocal songs. The sound system also squealed a few times. Those problems were mostly minor but a little disappointing. 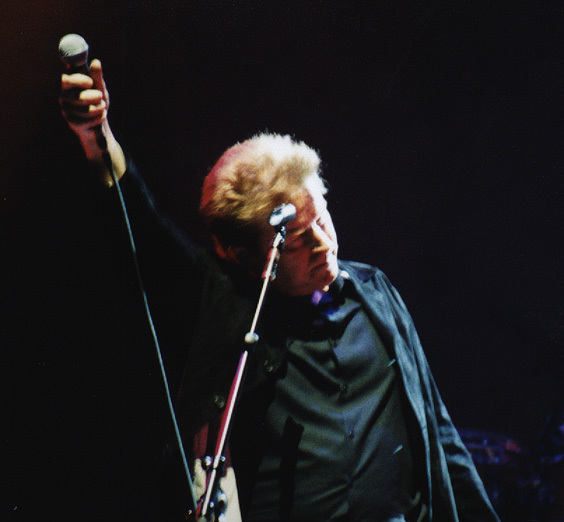 One of my favorite parts was when Don Henley was singing “The Long Run” and when he sang about the debutantes in Houston couldn’t hold a candle to you, he sang it to Joe, who mouthed, “Who, me?” That was kind of cute. Also kind of fun was when the 4 guys in the brass section were doing a little dance while they weren’t playing. One observation I had about the people attending the concert was that a lot of them seemed to be there only to hear “Hotel California”. As soon as that song was sung in the encore, a large number of people got up and left. I thought to myself that it ain’t over until the fat lady sings--or until the Eagles sing “Desperado” so where in the heck were they all going? I just can’t see paying that kind of money for a band you only feel lukewarm about or going only to hear one of their songs. That seems pretty ridiculous! But, hey, maybe these people have a lot more money than I have!